I was watching “Remember the Titans” recently on cable, as one is prone to do during summer evenings in the offseason when the only other alternative is baseball and you need to find something the whole family will agree on. During the Titan’s championship game I observed a minor flaw in the attempted overlap between the story, its characters, and actual football tactics. For the most part they do an awesome job of marrying the two but with a hangup I broke down on Twitter in a multi-tweet thread that occurs in the championship game. I’m going to go over what I covered in twitter as well as some of the other football strategy/tactical elements here in greater detail. Football is essentially a war game, the ultimate collectivist enterprise, in which you need an ultra-strong sense of community because all of the tactics require that you be willing to sacrifice yourself in the hopes that your teammates will make good. The genius of “Remember the Titans” is the way that it involves football tactics as a way to tell a story of two communities becoming one and they chose defense as the main place to focus. For good reason as the historic 1971 T.C. Williams Titans upon which the story was based was apparently a classic “3 yards and a cloud of dust” offense paired with an absolutely dominant defense. The statistics from All-American Gerry Bertier that season are absolutely stunning, he’s credited with having 142 tackles, 42 of which were sacks. Let me say that again…dude had 42 sacks. It’s not always clear in the movie who’s doing what but we get a few scenes that reveal what they’re trying to do on defense and why their lack of trust and teamwork is thwarting the plan. Julius Campbell is the left defensive end and Gerry Bertier is the middle linebacker to that strong side. As you should have guessed from the “4-4” designation, this defense only has three guys in the secondary. I’m thinking that “Petey” Jones and the Ryan Gosling character are that additional outside linebacker playing over the tight end. We’ll come back to that. The problem is that the defensive end needs to protect the linebacker from that tight end or tackle over him from climbing up to him at a favorable angle. Bertier is complaining that Julius is just using his athleticism to try and win the edge every time while allowing blockers to come at him from a down angle. The goal is to occupy Bertier (#42) with the inside option, block Campbell (#81) with the racist tight end, and then get a two-on-one vs whoever the outside linebacker is (Ryan Gosling, perhaps) with the option. The problem on this play isn’t the lack of coordination between the defense but the fact that the racist tight end isn’t blocking Campbell worth a lick and consequently the selfish DE is smashing the QB (Rev) before he can make a read on the linebacker. After getting chewed out by Bertier they run the play and you see the racist tight end maintain the block long enough for Rev to get out on the perimeter before losing control of Campbell, who then runs down and smacks Petey when he receives the pitch. I guess that effort was good enough for Bertier, even though it’s still Campbell making the play. You have to wonder if they upgraded not only their teamwork and avoidance of the odd bad play but their overall blocking by getting the racist out of there. Campbell was smoking him. I’ve drawn up what they showed in the movie, whether or not a split-back veer play would ever be drawn up and executed in this fashion against a 4-4 stack is another matter. In general it seems that Bertier is concerned that Campbell is rushing past the racist tight end to get up the field and inflict licks like he got in this clip but with the result of the right tackle (the big guy) and the racist tight end getting down angles on Bertier. The movie portrays things in such a way that you get the sense that Campbell is the star talent but evidently the main push that needed to occur was for him to anchor things well enough to free up Bertier to wreak havoc. Bertier’s star qualities in the movie are a few montages where he’s killing ballcarriers, a funny scene where he goes over to an opposing sideline and threatens an opposing coach, and his leadership. In real life Bertier was the playmaking talent on this team. As you see above, the Titans are a split-back veer, triple-option team. Six plays, split-veer, give it time it always works. Makes sense given that Boone is all about perfection and execution that they’d go with something akin to the modern RPO spread offense in which each play has built in answers for different responses and they just look to smash opponents and wear them down. Of course when Rev goes down with injury they add Sunshine’s vertical passing elements to their offense and really take off. First he has to master the pitch so that whichever of those six plays (and it’s probably only one or two) is a play-action passing play can work properly. I think these parts of the movie are pretty obvious to most casual fans, they explain it clearly in the movie. Petey gets booted from offense both because he fumbles a lot and also because he blocks poorly, as you can guess from the alignment of the split-back veer, both running backs need to block at times. 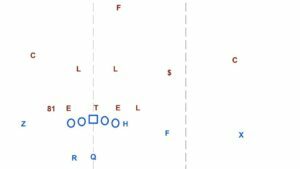 It’s not like the I-formation where the fullback and running back have more specialized roles where one focuses on blocking and the other on running, these older school offenses required the formation of more complete backs. 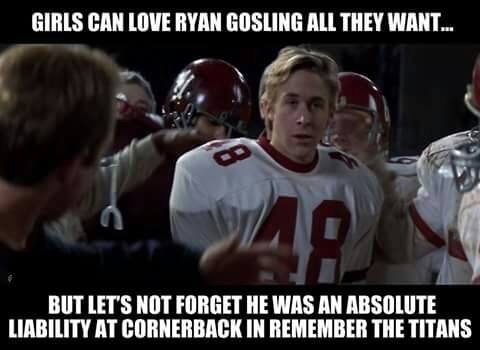 The funny thing about this meme, I mean besides the joke at Gosling’s expense, is that he didn’t play cornerback for the Titans in the movie. He’s at linebacker. The 4-4 stack defense was a forerunner to a lot of modern 4-2-5 defenses, especially the Virginia Tech defense that Bud Foster inherited from Frank Beamer. So those two outside linebackers in modern versions of the 4-4 stack are now safeties, essentially. They get into trouble with Gosling in that outside linebacker for the same reason that you don’t see teams play the 4-4 stack anymore against the spread. He gets eviscerated trying to cover teams that use their inside receiver (the tight end, usually) to run routes rather than helping combo block guys like Campbell and Bertier. It’s a brilliant strategy by opposing teams, really. Evidently no one could block the Titans’ “strong side!” so there wasn’t much point in trying to run at those fellows. Of course in the movie (not in real life) Bertier is hurt for the main game. But since they portray Campbell as an exceptional talent this approach still make sense. The Titans only seem to play two teams in the movie that can make anything of their Gosling weak spot. Whoever they play early that leads to Gosling getting pulled so they can make the most of stone hands Petey, and then the team they play in the title game. Now the team still needs to come together in two ways to finish their perfect season and make the big, triumphant statement with a Virginia state championship. The two coaches need to fully unite and Petey needs to learn to own his responsibility to the rest of the team and get over his propensity to sulk and bail when rebuked. The story looks to combine these two elements in terms of football tactics with two major plays…and neither of them really make sense. First they have Coach Yoast humble himself and ask Coach Boone for help in stopping the “shotgun spread” offense that their championship game rival is using to pick Gosling and the Titans apart with the passing game. Why Coach Boone would be any kind of expert on handling that sort of attack given his own preference for an ultra-simple, ground-based offense is not explained. What Coach Boone can and does do is authorize the release of offensive players to be used on defense. They move Sunshine and some other characters over to defense, presumably to upgrade the athleticism on the field to avoid getting picked apart. This makes a good deal of sense, if the other team isn’t going to run at Campbell and your run-stoppers then you need to get lighter, pass defenders on the field. Now come two elements to this strategy that don’t add up. First of all, they’re still leaving Gosling on the field at outside linebacker and he has to ask Coach if they can put Petey in instead. Wouldn’t this already be handled with the three or four guys coming over from offense? Isn’t Gosling the major liability that play should be looking to resolve? Alan is the Gosling character and he interrupts Yoast at this time to explain that Petey needs to go in. We’ve been seeing Petey on the sideline giving Gosling tips on how to stay in front of the opposing receivers in a “bend don’t break fashion” so he’s basically learned his lesson. That’s great, good story. The problems are “we’re going 5-2 monster” and “we’re going zone.” The 5-2 monster defense is exactly what it sounds like, it’s a sort of forerunner to the 3-4 defense and the idea is to pack five guys on the line of scrimmage with only two linebackers behind them and then your normal four-man secondary. Apparently this was already in the Titans’ package. The nice thing about this defensive adjustment is that it put Campbell in his natural home as an edge player and more of a OLB. No more worrying about splitting time grappling with tight ends in order to protect Bertier. Indeed this is the adjustment that modern teams have made to the same spread challenges, featuring the edge-rusher as their best player rather than the downhill mike linebacker. Where Petey fits into this is less clear, presumably at whichever LB position was responsible for covering the tight end or whatever. This stuff they throw out there in brief, jargon-rich dialogue is barely possible to draw out in terms of actual football schematics that make sense. The “we’re going zone” part is almost sheer nonsense. First of all, if you’re moving a bunch of athletes from offense over to play defense for the first time in their lives and you want something simple to go out and execute you don’t go to a zone. I’m sure the Titans’ zone wasn’t a pattern-matching scheme that would require weeks of offseason drilling to nail down, since those didn’t exist yet, but it’s still pretty hard to do right on your first try. You move over your best defenders and roll into a 5-2 with Campbell loosed on the edge to get a DB on the field in place of an outside linebacker and play man coverage, indeed that’s what you see when they show clips after that. You see guys playing in a trail technique. But if that was the plan wouldn’t you look to replace Gosling, the coverage sieve? This plays out with Campbell making a key play by running a play down from behind like a true weak side DE/OLB and stripping the ball carrier. Petey picks it up and then hangs on, for once, as the ball carrier when a particularly aware offensive player puts his hat on the ball. Except their game-winning play comes when the opponent pulls everyone back to play coverage in anticipation of some kind of “hail mary” double-pass involving Rev and Sunshine and instead the Titans run a reverse in which Sunshine throws something like 25 successful lead blocks to clear the road for Rev. Little bit of game theory there from Coach Boone, although it’s his hat tip to a recommendation made by Coach Yoast. At any rate, it’s hard to reconcile the “Gosling problem” with the coaching adjustments in a way that actually makes sense. Honestly they probably just had the writers steal some jargon from styles of the time without thinking through how that could fit together but it almost does, in the way I’ve described above. Overall I think the movie is fairly brilliant about fitting actual football strategy into the story in a fashion that actually serves the character development and progression of the narrative. Indeed, it also almost tells the story of modern football with the way they added in the spread passing challenge to the “run the ball and play defense!” style of the Titans. Football is a great game, and making the most of a diverse community while requiring them to work sacrificially for each other is one of its stronger points. People often get hung up today on the sacrifices needed to play the game without considering that while they should be limited (since it is a game) they are what raise the stakes to the point where the positives taken from the game become really deep and powerful. “Remember the Titans” gets that right and most of the football stuff as well. Upon seeing the movie for the first time, I figured the entire “strategy” for the final game was a bunch of Hollywood writer crap. But kudos to you actually trying to fit it somehow to make sense. Personally, my brain could not process the idea of playing a 4-4 the entire season, facing a shotgun spread team, and then suddenly switching to a 5-2 zone defense at halftime. At halftime! Really? You know how long it takes to install a 3-4 zone defense to match up with 3 wide receivers with motion? Just describing everyone’s responsibilities and adjustments for one call takes 20 minutes. And if you’re sending 5, which presumably they are because the problem appears to be a lack of pressure, it takes even longer. Great movie. Hated that part. You have to assume that the 5-2 monster was already in their package or that part makes zero sense. I mean, I’m sure it’s just writer crap trying to copy real football jargon from the times, but that’s how you’d make sense of that. Things really unravel there at the end, tactics-wise, before that they were doing fairly well. Even if you assume it was in their playbook, it still doesn’t make sense to trot that out in the second half of the championship game without at least re-installing it during practice leading up to the game. Which if they had that scene, then it might have made sense. Maybe even been cool. We could assume that maybe they did though, or that they used it regularly throughout the season in addition to their 4-4 stack, even though that’s pretty improbable for a HS team. That’s a lot of assumptions for me to suspend my disbelief. 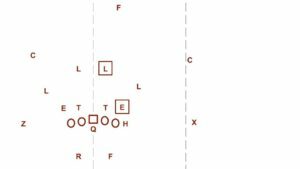 Of course, there’s plenty HS squads I’ve seen run a bunch of different fronts from base 3-4 personnel, like 4-3 Under, 2-4-5, etc., but never a 4-4 stack. Maybe the closest I’ve seen at any level is the Patriots in a game against the Jets back in 2011 or 2012. Anyways. Great movie. Enjoyed the breakdown. I got the sense that the shotgun spread faced in the final game was something the opposing team (Marshall) installed for the championship. Based on the fact Boone and staff had like 15 films in the lead up he carried around (shown when he arrived home after semi final to his wife and kids outside – and when he and Yoast are disagreeing over the press conference). So the fact they seem unprepared for it makes sense. But according to one of the deleted scences they had a 5-man front and a 4-man front in. 5 man front offers more up pressure up front and allows their physical DL to just beat up the OL. Whereas a 4 man front may require an additional blitzer from depth. If Marshall is throwing West Coast style 5 man rush offers a more immediate rush. When it says Bertier had 42 sacks for like 400 yards in losses, in reading articles from that period, I believe that it is more intended that he hit the QB that many times (between QB runs like options and pass rush opportunities). Campbell hit the QB like 34 times himself. I believe it would be ridiculous for a team to amount 75 sacks between 2 people. But perhaps the most ridiculous football part of the movie for me is the winning play at the end. Sure the reverse could be a good call, defense may not be expecting it. Fine. Jet motion/hand off is something I don’t think I saw from that time so that is off too, but whatever. More annoying is how QB Ron Bass throws not 1, but 2 crushing blocks. Not just that, the kids are helicoptered out of the play. And QB is still standing to lead the way into the end zone after it. Too Hollywood for me.